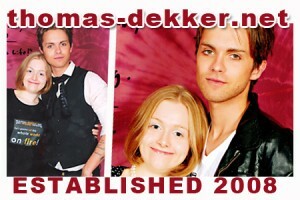 It’s Thomas Dekker Source’s 6th birthday! This site has been online in some form or another since August 2008! Time flies when you’re having fun and supporting someone truly deserving. You may have noticed we are rocking a new theme which was built by Velvet Suite Designs and customised by myself – for the first time in the history of the site. I made the header using an amazing photograph by Amanda Rebholz – check out her site! Without getting too sentimental I wanted to say how much I have enjoyed following Thomas’s career for as long as I can remember, somewhere back around the Honey, I Shrunk The Kids era. I started the site when Terminator first came onto our screens in the UK and stole my heart. It was a show about family first and foremost and a lonely, vulnerable boy that had the weight of knowing he would one day lead and save mankind on his shoulders. It spoke to me, for whatever reason. Since then I have loved everything that has followed, especially Kaboom, All About Evil and Squatters. I am eagerly awaiting the newest endeavours and Zero Times Zero is still on repeat in my car. On a personal level, I feel as if running this site has broadened my horizons and made me a much braver person. In a few short years I’ve gone from a virtual recluse with social anxiety, panic attacks and severe self-consciousness to being outgoing and talkative and following my dreams. I have been inspired by meeting the lovely fans at conventions, getting up and asking questions in front of hundreds and talking to people on twitter – and most of all by Thomas himself. I cannot even begin to describe how supportive and kind he has been to me personally over the past 4 years, since we first met. Instantly, he was so generous and open. Last year in particular, seeing him for a fourth time really inspired me to come into my own and stop sitting on the sidelines; to actively seek out new opportunities and to enjoy myself without worrying what other people thought – or how I looked. I feel confident and brave and it has a lot to do with the past four years and of this inspiration. Lava Life has given me a new mantra and a new way of seeing the world – of reminding myself that everything passes and that there is always something to be hopeful about, while Liberated has summed up everything I am thinking and feeling right now but never knew how to express. That there are challenges, obstacles and heartaches and that bad things happen, but that we are stronger for surviving these things and that they make us richer. That we must hold on through the bad to find the good. It has spoken to me on a very deep, personal level and it takes a true talent to be able to produce something that people relate to so completely. Thomas is the ultimate example of someone who is delightfully eccentric and shares it with the world; someone who is genuinely interested in people and who can inspire others to do things they never expected to do and will actively encourage them. It’s rare and special and I have been lucky enough to experience his real kindness and sensitivity. Thomas is also honest about what he cares about and what he’s been through and that’s incredibly scary for any of us – but especially for someone with the world watching. But these things are precisely why he’s Thomas and why we love him! Anyone who has met him will agree with me I’m sure that we have a true and genuine role model, friend and talent and that we will eagerly follow wherever the future may lead. Thank you Thomas for many wonderful years and for those still to come! Update: thank you for all the tweets they are lovely and much appreciated! @sandy6259: @tdekkersource @theThomasDekker Happy Birthday. Also thank you for creating this site that allows us to have regularly news about Thomas. There will be various updates to all of the pages ongoing this month and a special project coming soon, so stay tuned.